The universe looks like it was designed. Scientists have found that the physics – the laws and the values of physical constants – all seems to fit together just right to produce life and allow us to live and observe it all. But how did this happen? Was it an amazing coincidence? Is there some underlying reality (whether a physical necessity or a supernatural creator) that made it this way? Cosmologists can calculate what they believe happened from the very earliest moments of the big bang, and can estimate the values of a range of cosmic constants and physical properties. There are scores of these numbers, but not all are independent. Physicist Paul Davies lists 13 constants and 12 derived quantities; cosmologist Martin Rees discusses six numbers, but as most of these are ratios of other numbers, his total comes to about a dozen. 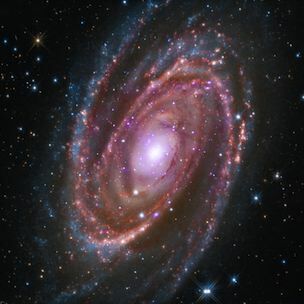 It turns out that many of these numbers must lie within very narrow ranges, both now, and right back at the early stages of the big bang, for the universe to exist and form galaxies, stars and planets, and to provide the opportunity for complex life to appear. A list of some of the most notable of these examples of “fine-tuning” (e.g. relating to the strength of the four fundamental forces, the mass of fundamental particles, etc) is at it looks like it was designed, so I will only describe two of the most amazing examples here. Cosmologist and mathematician Roger Penrose once attempted to calculate the probability that chance allowed the initial state of the universe and its entropy to be exactly ‘right’ to allow it to still exist now. His answer was 1 chance in 10^10^123, a probability so small as to effectively be zero. To get a picture of this number, note that the number of baryons (protons & neutrons) in the universe is estimated to be about 10^80. We could write that number as 1 followed by 80 zeros. But to write Penrose’s number would require 1 followed by a zero on every baryon in the universe, and then more. In addition to the Penrose estimate, Lee Smolin says: “…. just how probable is it that a universe created by randomly choosing the parameters will contain stars. Given what we have already said, it is simple to estimate this probability. ….. The answer, in round numbers, comes to about one chance in 10^229.” This is much much less than the probability of picking a given baryon out of the universe at random. These rules look as if they are the product of intelligent design. I do not see how that can be denied. Whether you wish to believe they really have been so designed, and if so by what sort of being, must remain a matter of personal taste. ….. Although many metaphysical and theistic theories seem contrived or childish, they are not obviously more absurd than the belief that the universe exists, and exists in the form it does, reasonlessly. This would be the first and preferred choice of most scientists, because science tends to assume there are underlying reasons for things and searches for them. And it is certainly still the preferred option of many (e.g. I think Stephen Hawking held this view). But there has been no success so far in finding an underlying reason, and it becomes almost a matter of faith rather than of science. Many cosmologists (e.g. Weinberg, Rees, Susskind, Davies) have concluded that the fine-tuned numbers are too disparate and unrelated to be based on an integrated theory, and gradually more of their colleagues are moving away from this view. Nevertheless, it remains possible, even if increasingly unlikely, that an underlying theory will be found. This has probably become the most favoured option over the past decade. It overcomes the objection that the fine-tuning is too unlikely to have occurred by chance, by postulating that there is an extremely large number of universes or “domains ” of the one universe, perhaps even an infinite number, all with different values of constants, and perhaps even different constants as well. Ours is one rare case where the universe allows life to appear. The mathematics has been done, and the multiverse is claimed to be consistent with cosmological theory. Leonard Susskind says multiple universes are “inevitable consequences” of known science. The theory has been controversial. Martin Rees says: “These universes would never be directly observable, even in principle.” Susskind: “The existence of other pocket universes remains a conjecture”. For this reason, many scientists say the multiverse is pseudo science, “more like metaphysics than physics”. But proponents believe if the theory behind the multiverse can be tested in other areas, it would give confidence that it may be correct where it cannot be tested. But, as Davies has pointed out, if there are indeed multiple universes, then one still has to explain how a multi-universe “generator” came into existence, so finely tuned as to produce an array of universe with different characteristics. None of the four options listed by Rees can currently be demonstrated by science, and perhaps never can be. In a sense, believing any one at present requires something beyond science, call it faith, or judgement, or a sense of fitness, or whatever, and probably always will. But it seems to be the most common view among scientists that the idea of a “lucky coincidence” can be dismissed, and the underlying theory has no answers at the moment except for the multiverse. Many scientists (such as Rees and Susskind) believe one day there may be enough evidence to say it is probable. I find the multiverse hypothesis amazing. It requires us to believe that not just one universe came into existence for no reason, but that a universe generator capable of producing an enormous number of universes or domains appeared for no reason. It seems to magnify the problem of finding an explanation, not reduce it. And yet, it may nevertheless be true. I find many aspects of quantum physics to be incredible, yet the scientists assure us they have been shown to be true. So perhaps we do inhabit one of zillions of universes or domains. But this hardly changes the difficulty of explaining the facts. Because, if we live in a multiverse, how can we explain that the process that generates all these separate universes manages to make each one with different sets of physical laws and constants (something required if the multiverse hypothesis is to explain the amazing fine-tuning)? Thus, if there’s a multiverse, how did it come to be the way it is? If there’s an underlying theory, how come it’s so finely designed? Those are questions beyond the scope of science, and each of us can choose what we consider seems most likely to be correct. But whatever type of universe we live in, it seems that it has to be extraordinarily special, and that cannot easily be explained by science. It requires either design by a God or coincidence almost beyond belief. “The laws of gravity, quantum mechanics, and a rich Landscape [the set of all possible universes] together with the laws of large numbers are all that’s needed to explain the friendliness of our patch of the universe. But on the other hand, neither does anything in this book diminish the lilelihood that an intelligent agent creaed the universe for some purpose….. [But] If there is a God, she has taken great pains to make herself irrelevant.”(Leonard Susskind, “The Cosmic Landscape”). Prize-winning US astronomer, Allan Sandage, “the world’s greatest observational cosmologist”, became a theist at age 50. “The world is too complicated in all its parts and interconnections to be due to chance alone.” Read his essay, “A scientist reflects on religious belief“. “the string landscape may explain how the constants of nature that we observe can take values suitable for life without being fine-tuned by a benevolent creator.” (Nobel Prize winner Steven Weinberg, “Living in the Multiverse“). Image Credit. 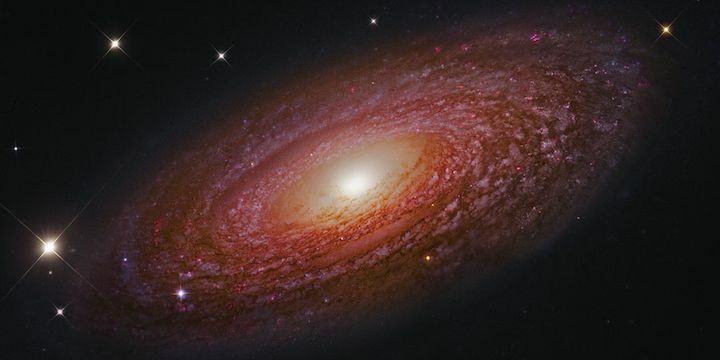 Main image: Spiral galaxy NGC2841, from Hubble, Subaru; Composition & Copyright: Roberto Colombari via NASA. 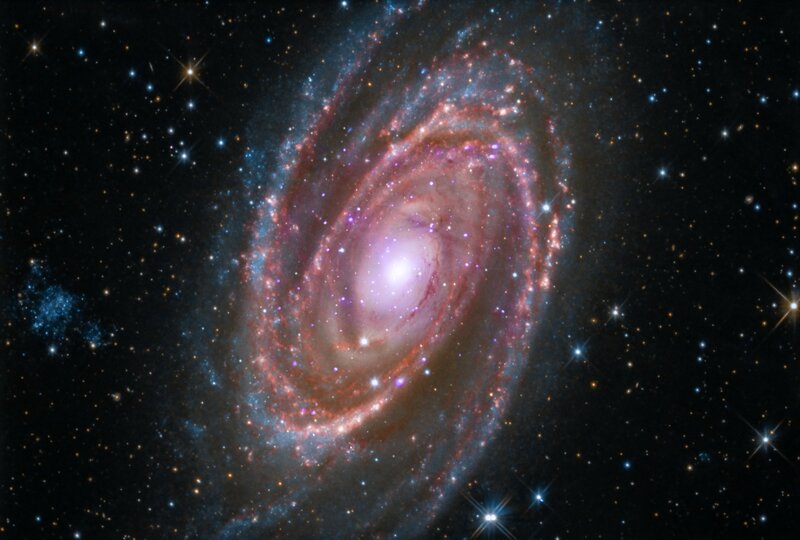 Smaller image: Spiral galaxy M81 by NASA.